Like it’s sixth edition brothers and sisters, the Chaos Daemon book has two choices for detachments. The Combined Arms Detachment (CAD) and the Allied Detachment. This means that your troops have objective secured and your warlord gets to reroll his or her warlord trait (if it isn’t fixed). As for Chaos Daemon Warlord Traits, you’ve got six to choose from, about half of which are not good, more on that later. Of course, it seems that most TOs have ruled that summoned, or otherwise created troops (such as via the portalglyph) are not part of the detachment, and therefore do not get objective secured. Another consideration on how you include Daemons in your army is the War Storm table. If your primary detachment is Chaos Daemons, you get to roll on this table every turn (whether you want to or not). At that start of each of the controlling player’s shooting phase you roll 2D6. 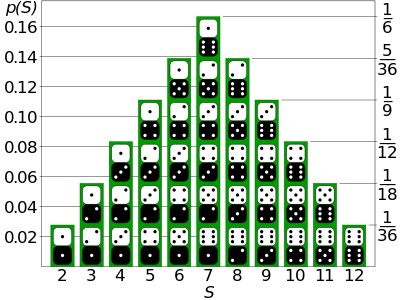 The normal distribution of this roll is shown above. Results 2, 3, and 4 are bad for the Daemon player. 5, 6, 8 and 9 are all bad for your opponent, and each of these results is bad for one of the four chaos gods’ units (but this can be mitigated with musical instruments if you don’t mind breaking the fluff). 7, which occurs most often, does nothing at all. While 10 and 12 are good for the daemon player, and 11 is bad for your opponent. The reason that I cover this is that the randomness of the table can seriously let you down at inopportune times. In order to reliably win with daemons you must have a way to mitigate the negative effects of the Warp Storm table. So, assuming you don’t get lucky and roll the one warlord trait that allows you to reroll the warp storm results (because even with a reroll on the warlord trait table you’ll only get what you want 1 in 3 games) you need to know what your risk exposure is, and how to mitigate it. If we assume that rolls of 2, 3 and 4 are bad enough to tilt the balance of a game in your opponents favor (and they are), then you’re going to have a bad game 1 in 6 games. Playing in a local 3 round RTT you might be just fine, but in a 6 round GT, the odds are no in your favor. Now, we’re already determined that random warlord trait allocation isn’t going to solve this problem for you. So, what’s left? 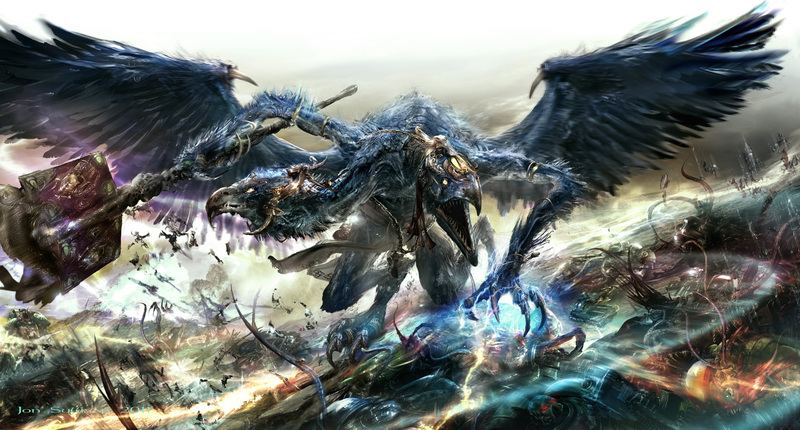 Kairos Fateweaver. The 300 point competitive Chaos Daemon tax. This leads us to the HQ slot. at 300 points, is only slightly less expensive than the other really good choice, Be’Lakor, who tips the scales at 350 points (plus the cost of the dataslate). Let’s break down his cost and see how much “tax” is really involved. So, while some of these points values may not be bargains, if you take Fateweaver, you’re really not paying a tax for his two reroll powers. Because, in addition to rerolling the warp storm table, you get to reroll 1 die per player turn. When you couple this with the warp storm, it allows you to really skew the results in your favor. So, unless you’re playing in a meta that hasn’t nerfed invisibility, Fateweaver is your go to over Be’Lakor. I’m building lists for 1850 points lately, so with -300 for Fateweaver, I’ve only got 1550 left to spend. This means I can’t take another expensive HQ. Fateweaver and Be’Lakor are probably out. There are other interesting options in the HQ slot, but I’ll direct your attention to Heralds as the answer to building a competitive daemon list. The alignment of your heralds depends on the alignment of your army. Heralds buff other units as a general rule. They also provide you will access to psychic masterly levels. Khorne Heralds aren’t bad, but outside of Flesh Hounds, I’d opt for other aligned units in each battlefield role. So, you’ll probably not choose Skulltaker, Karanak or a normal Herald of Khorne. The Changeling used to be great, but in this codex he costs about twice what his gimmick is worth. Lacking Independent Character, the Blue Scribes are a kill point waiting to happen with no significant upside. A Herald of Tzeentch on disc is a solid choice, and a common bearer of the Grimoire of True Names. The Exalted Flamer was added to the codex after printing. It’s shooting would be great if it kept relentless from the chariot even when on foot. Epidemius only really works if you have a mono-Nurgle army. The Herald of Nurgle is a good choice if you take a unit of Plague Drones. It’s a shame the only steed option is the palanquin, as a drone would be amazing. The Masque would be great if you could keep her alive. The Dance of Death is a great answer to the Green Tide; not something to build a list around though. A normal Herald of Slaanesh is good, paired up with a unit of Daemonettes or Slaanesh Furies. A Herald on a Seeker is better. So, from a buffing perspective, I’m looking at the Disc Tzerald, Nurgle Herald and Seeker Herald. However, you have to have a place to bury these ICs to keep them alive long enough to use their buffing powers. In a land raider, bloodletters are great. Otherwise, there are better choices. Pink Horrors are really good. At 99 points, a unit of 11 will generate 2 warp charges per turn, knows one malefic psychic power and Flickering Fire and rerolls saves of 1. This means that you can go to ground in a ruin and get a 3+ cover save, rerolling 1s. They’re objective secured and can deep strike. This is my go to troop. The down side, is they’re horrible in combat, they have no shooting, and their psychic shooting is hit or miss at BS3. Plaguebearers come in at 90 points for 10, can deepstrike, have shrouded, and defensive grenades. So, they get a 2+ cover save in a ruin without going to ground. And, they have a plaguesword which is poison (4+) and glances armour on a 6. They do not generate warp charges. Daemonettes are 90 points for 10, and have strength 3 rending at I5, provided you don’t charge through cover, are fleet and run D6+3 inches. In larger squad sizes they can be quite scary. Nurglings can infiltrate with shrouded and objective secured. At 45 points for 3 models with 4 wounds each, if you can hide them on an objective, they might just rack up some points for you. There isn’t all that much good to say about the elite slot in this codex. Bloodcrushers are really expensive at 45 points for a multi-wound T4 model. Flamers were neutered in this book, and are really only good against 4+ save or worse infantry. The Beast of Nurgle doesn’t really offer anything useful in the current meta, and Fiends, while cheaper than Bloodcrushers, are still 35pts each with T4. As a rule, I don’t include any elites in my army, but I will consider summoning them as the game conditions dictate. In my opinion, Flesh Hounds are the best Khorne unit in the codex. You really need a large squad of them to put the pressure on your opponent. You’ll want to scout them in most cases to guarantee the turn 2 charge. At 16 points for a 2W model with WS5 and Str5 on the charge, they’re pretty respectable. You’ll want to consider putting the grimoire on them the first turn to keep them alive. Screamers of Tzeentch are my personal favorite. Jetbikes with a flyover attack, jink and the ability to swap attacks for S5 AP2 with armourbane means you can threaten anything, anywhere. They also provide a great caddy to hide Disc Tzeralds. 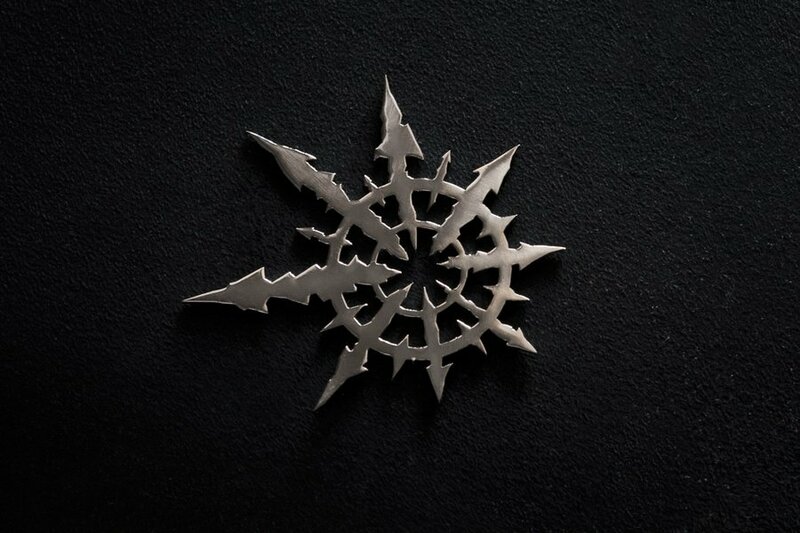 There is a reason why the screamer star is a thing. Something I want to use more of is the Plague Drones. At 42pts each they are pricey, but T5 3W is a mini eternal warrior. Jet Pack Cavalry gives them solid mobility, 12″ move, fleet on the charge, and a 2D6 assault move. Coupled with a Nurgle Herald and the FNP locus this shrouded unit can be very durable. Like plaguebearers, they pack defensive grenades, poison (4+) and glance on a 6 with 3 attacks base. The ability to upgrade the unit to have either 1 attack each with instant death, or poison (3+) for 5 pts a model is nothing to sneeze at. And, if you really want to pile the points on you can give each model 2 poisoned shots at 12″ for another 5pts. Chaos Furies are useful if they are Slaanesh marked with a Herald on Seeker to keep their leadership up. Seekers are super fast, and can put out a huge amount of damage. With the ability to outflank as well as deepstrike these girls and their steeds provide a lot of flexibility at a very cheap price. At 170 points, I like a Tzeentch Soul Grinder with the Plegm Bombardment. The problem, is that they are such a threat that even with AV13 and 5++ (rerolling 1s) it almost always gives up first blood to a shooty army. I know people like Nurgle and Slaanesh Grinders, but shrouding a Soul Grinder is only great if you can actually get 25% cover, and walkers are still slow. The skull cannon isn’t bad either. When used effectively, it essentially provides your army with assault grenades, but at 125 points its S8 AP5 damage output is very situational. I really want the Burning Chariot to be good. 7th edition chariot rules made it usable, but AV10 is a liability. And at 100pts its not worth it. I have the same issue with Seeker Chariots. Finally, Daemon Princes, I’ll cover here, because it’s not likely you’ll take them in the HQ slot. The problem with Daemon Princes is that 7th Edition made them 1 turn sitting ducks before they can assault, and a Daemon Prince belongs in assault. They’re too expensive to use as late game scoring, especially without objective secured. This entry was posted in Gaming and tagged 40k, Chaos Daemons, Competition by Peter Kelly. Bookmark the permalink. Not sticking to one or two armies this year? I’d love to play a bunch of armies, but I’m not a freaky speed painter like you are. I do not understand how you got 2 psychic powers from different disciplines with the pink horrors…as far as I’m concerned, chaos focus does not stack with psychic focus. Could you please elaborate more on that one? In my opinion, Psychic Focus doesn’t apply to daemon Psykers. Instead, the Chaos Psychic Focus rule applies (see BRB Page 22 callout box). In the example I gave above I roll once one malefic and take whatever power I get, or swap for the primaris, and then the Chaos Psychic Focus rule applies and gives me Flickering fire for Tzeentch Psykers. Daemons are required to take anything from their god, but are limited to rolling for no more than half. Excerpt From: Games Workshop. “Warhammer 40,000 (Interactive Edition).” Games Workshop, 2014. Interested in creating a mono Nurgle Army. What would you recommend? Are you looking for mono-Nurgle daemons only, or mixed Nurgle daemons and Deathguard? I assume you’re looking for ideas that will still be competitive in 8th edition?